We would love to know what you make of it – the audience at the conference and online at the virtual conference were positive about what we had to say and how we went about saying it – which was gratifying as we were both scared about being first-time presenters! We have added dedicated pages for both this video and an online interview we were asked to do for the online conference after our presentation. We had a great time and would like to thank everyone we met and spent time with! I’ve just managed to catch up with your presentation over at the Harrogate site – it was brilliant! I really enjoyed it. Of all the presentations I’ve seen so far, I’m sure yours will prove to be the most influential. It really was incredibly thought-provoking. Also, if Scott and Luke won’t sponsor you, then I’m sure the major tea-producing companies of the world will happy to! I just watched your presentation and I think it was excellent, inspiring and interesting! Well done! I’m a CELTA and YLX trainer and assessor and I would love to do the same thing with the courses I work on. I feel thrilled at the possibility of incorporating this approach, but feel I really need to sit down and go through all the notes and info you give in your blog. Thank you very much! Thanks for the feedback! Glad you’re having fun browsing – we’ll be adding a couple of updates shortly so come back again soon! 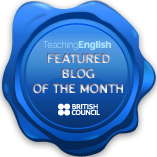 Like your blog, by the way – especially those CC links, so thanks for sharing too! What you are doing really interests me – wish I’d been at the session – I watched the video and wanted to put my hand up and ask questions and talk to the person next to me about it. Anyway, I’ve added a few questions at http://www.trainingelteachers.net and told everyone to watch it! Thanks for dropping by! Thanks also for spreading the word and for posing some critical questions – if you’d like to explore them, feel free to write in! By the way, I enjoyed watching you work the one time I had the chance, presenting the teacher training video support attached to Business Result, as I recall! I’ve just returned from a trip and I’m so glad I didn’t fall asleep straight away. I didn’t think I was going to make to the end, but it’s been a very well-spent hour! Perhaps one day I’ll have a chance to go to IATEFL myself and attend one of your presentations. As you well pointed out, the Dogme list is an invaluable source of ideas and offers lots of food-for-thought. I’d love to have been there and asked a couple of questions myself. In the meantime, I’ll just keep reading what you’ve been writing here. It was really good to find some validation to what ends up happening in the initial teacher training I do – even though it’s nothing close to a CELTA. I end up spending most of our training talking to applicants about the teacher and the learner, i.e. the core of any teaching setting. I always felt a bit worried about not having the proper time to discuss other things at length, but at the same time I knew they’d been already discussed (I hope you could get my point there). Thank you very much for keeping the blog! Thanks for staying up past your bedtime to watch us! It seems to me that when you focus attention on the teacher and the learners, and the interplay, then most anything worth discussing about learning will come to light, so what you say you do strikes a chord with me! Just finished watching your amazing presentation at IATEFL. Unfortunately I couldn’t attend it this year, but thanks to technology I could still be touched by one of the best presentations I’ve ever seen. It’s truly inspiring and it does give me the sensation there are still people out there, like the two of you, who are committed to providing teachers and learners with nothing but the best! Thank you! See you in Rio or the UK one day? Thank you very much for visiting and for your very kind response to your talk! We feel incredibly happy that you feel so positively about what we had to say and that you feel so energised by it – this is more than we dreamed of when we started this off, so thank you for making two teachers very happy! As for Rio, we’d love to one day – but if not before, maybe we’ll see you at Brighton 2011? Thank you for dropping in! And thank you for the positive feedback – makes it all worthwhile! Weekend courses are a cool idea – have to think about that one!